The Twin Dilemma has its negatives. Lots of them. There is one of the worst villains in Doctor Who history: Mestor the giant cross-eyed slug. Battling away with The Myrka & that bloody giant prawn from The Invisible Enemy as part of the cavalcade of the unloved. Mestor is richly voiced by Edwin Richfield, a British television regular whose face you would know, even if the name means nothing and here he is dressed as a giant slug working bloody hard to be a convincing threat. It is no shame on Richfield that Mestor is about as threatening as a marshmallow. It's the design. If your monster can't walk unaided then I'd suggest you are on something of a loser. So the main villain is rubbish. There's some distinctly average acting going on: Helen Blatch as Fabian and Dione Inman as Elena I'm looking at you in particular but the worst are the Conrad brothers as the eponymous Twins (although I'm never quite sure what the Dilemma is in this story but I digress). I'm not sure you can entirely blame them. Child actors are notoriously hard to cox a performance from at the best of times & being asked to play an indistinguishable pair of smug mathematical geniuses isn't ideal. It's like Adric squared. But they aren't great & this does hobble things a wee bit. So the main villain & the Twins are rubbish. The script by Anthony Steven isn't great & the direction, particularly after Graeme Harper's sterling work on Androzani, is positively pedestrian. So average script, bland direction, terrible Twins & the villain is a cross-eyed giant slug. This isn't looking good is it? 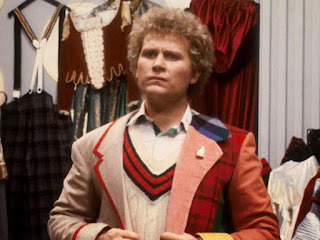 And this the first story of our new Doctor, Colin Baker. Now Colin is great in this. Yes, he's bombastic, theatrical, loud & dangerous but he is Doctor-ish. All the post-regeneration instability does make you question this new Doctor & it was brave to make him seem so unlikeable in the beginning. All of this works though & makes Colin immediately different from his predecessor. However Colin Baker's Doctor is sabotaged from 8 minutes & 21 seconds in to Part One. Why then? Because that is when he puts on that costume. From that moment he's stuffed. Everyone & everything is in competition with that costume & it isn't good. It makes a little sense whilst he is suffering from post-regeneration trauma but once he's recovered...? One of the reasons The Sixth Doctor is so great in the Big Finish Production is that Colin can be the Doctor without competing with his own ridiculous costume. Colin Baker proves in this story he's a bloody good actor & he could have been a great Doctor but a combination of BBC inertia, producer fatigue & that stupid bloody costume hamstring him. Not always & not entirely but enough. Nicola Bryant does a generally good job too, especially her dislike of this new person clumping about the TARDIS trying to strangle her. Kevin McNally does a fine job of being sarcastically heroic as Hugo Lang. Praise also for Barry Stanton (Noma), Seymour Green (Chamberlain) & Oliver Smith (Drak) who do a fine job as bird-ish Jacondans. Noma's a git, the Chamberlain is a creep & Drak a doomed hero & all give their characters a certain panache. Also unlike the terrible Mestor costume, the designs for the Jacondans look lovely: feathers, silver skin & beaky noses. Most lovely of all though is Maurice Denham as Edgeworth/Azmael who gives a world-weary touch to even the most banal lines & gets a lovely little death scene. So the Twin Dilemma isn't great but it isn't quite as bad as its reputation suggests. It's entertaining enough if you can ignore the cross-eyed slug, there's some nice performances & Colin Baker gets properly introduced. However I wouldn't reach for this one to impress the non-Doctor Who fan.